Tuesday's massive earthquake beneath the Gulf of Alaska, and much of coastal Alaska's tense wait for a tsunami, created more than one internet sensation. Larry, the mellow disaster-scare narrator in the Kodiak Island village of Ouzinkie, got lots of well-deserved attention. But in the moments just after the quake, a small buoy out in the Gulf of Alaska briefly stole some of the drama. 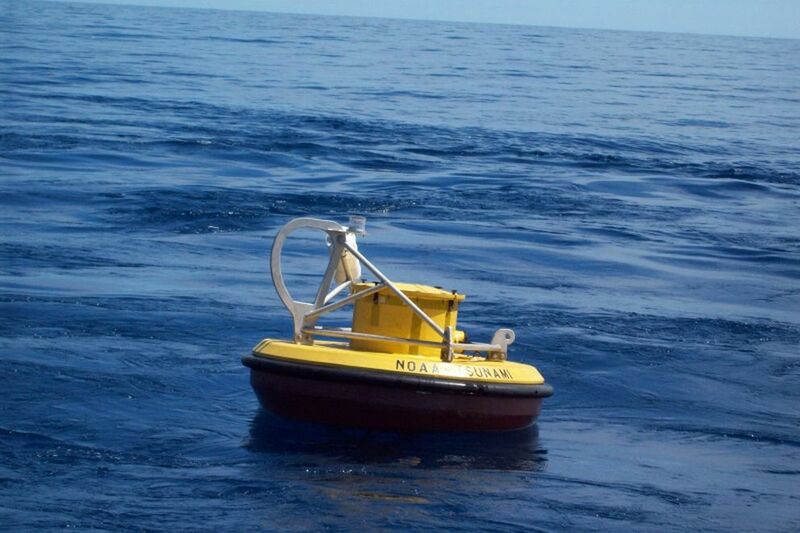 The buoy at station 46410, a deep-ocean data collector, predicted a tsunami that wasn't. Anybody logging onto the National Data Buoy Center site for a short interval could see that the buoy showed a red spike and a 10-meter water displacement. The "DART" buoy — that stands for Deep-ocean Assessment and Reporting of Tsunami — is one of 37, about a third of them off Alaska and the West Coast. The buoys measure how the entire water column moves up and down, not necessarily wave height. Tsunami scientists call the buoy reading an anomaly that reflected the seafloor undulations from the quake. But to the average coastal resident getting increasingly desperate for information early Tuesday, it wasn't hard to imagine a 35-foot wave looming in the North Pacific. And so buoy 46410 and all that moving water got shared — in text messages, phone calls and on social media. People in water-savvy communities around Prince William Sound — Homer, Cordova, Valdez — picked up on the reading. Susan Jensen lives in Sitka, where evacuation sirens sounded, but she heard the rumor in a text from a friend in Anchorage: "35-foot wave recorded!" Three other friends sent some version of the same. Jensen said she figured that couldn't be right, but still. "It generated a lot of chatter and ultimately false rumors, especially among my Kodiak friends," she said in an email Wednesday. Getting solid information while waiting for a wave in Kodiak was a struggle, said Alicia Wallace, who heard the big-wave rumor after she evacuated from Bells Flats on Kodiak Island with her 3-year-old daughter. "You had social media, which unfortunately isn't quite reliable," Wallace said. "Our radio was really wonderful. They talked most the night. … That's what we were all tuned into." Some in the news media picked up on the "wave" too. "The US National Weather Service has confirmed that a buoy located northeast of the epicenter has recorded a 10-meter wave," stated one report on digital news site Quartz. Even the National Weather Service, at least in Boston, posted a message about the buoy, though in a tweet that called it a "water displacement" and not a wave. David Hale was working the event at the National Tsunami Warning Center in Palmer early Tuesday when the wave rumors penetrated his bubble. "I was on a call with one of the emergency managers down in Juneau and he says, 'One of the DART buoys is showing a 10-meter water level,' " Hale said Wednesday, back at work. "And I said, 'What?? I'm not aware of that.' "
That station is about 30 miles from the epicenter. The sudden spike in water displacement so soon after the quake probably reflected the burst of seismic energy released, not a wave. The buoy is actually two parts: a bottom pressure recorder on the seafloor with "a whole bunch of batteries on it and a pressure sensor," and, about 100 yards away, an anchor attached to a surface buoy. The buoy receives the pressure readings and sends them via satellite to tsunami centers and the National Data Buoy Center. Earthquakes generate what are known as Rayleigh waves: undulating motions intense near the source and diminishing over distance. Hale said he's pretty sure that's what the recorder picked up. When Hale checked the data after getting off that call, he saw maybe 1 or 2 centimeters of displacement. He urged the public to wait a few minutes after a big quake if the buoys are close to the epicenter to let the seafloor settle. And be careful about sharing information. "In social media, there's a propensity to repeat things as fact because it is out there," Hale said.